Definition at line 113 of file BTFDebug.h. Definition at line 188 of file BTFDebug.cpp. Definition at line 196 of file BTFDebug.cpp. 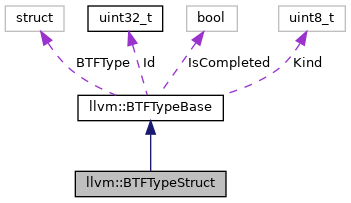 References llvm::BTFDebug::addString(), llvm::BTFTypeBase::BTFType, llvm::DICompositeType::getElements(), llvm::DIType::getName(), llvm::BTFDebug::getTypeId(), llvm::BTF::CommonType::NameOff, llvm::BTF::BTFMember::NameOff, llvm::BTF::BTFMember::Offset, and llvm::BTF::BTFMember::Type. Definition at line 217 of file BTFDebug.cpp. References llvm::MCStreamer::AddComment(), llvm::MCStreamer::EmitIntValue(), llvm::BTFTypeBase::emitType(), and llvm::Twine::utohexstr(). Definition at line 121 of file BTFDebug.h. References llvm::BTF::BTFMemberSize, llvm::BTFTypeBase::completeType(), llvm::BTFTypeBase::emitType(), and llvm::BTFTypeBase::getSize().